Raymond’s main research area for the past two decades is on data mining, with a specific focus on health informatics and text mining. He has published over 180 peer-reviewed publications on data clustering, outlier detection, OLAP processing, health informatics and text mining. He is the recipient of two best paper awards – from the 2001 ACM SIGKDD conference, the premier data mining conference in the world, and the 2005 ACM SIGMOD conference, one of the top database conferences worldwide. For the past decade, he has co-led several large-scale genomic projects funded by Genome Canada, Genome BC and industrial collaborators. Since the inception of the PROOF Centre of Excellence, which focuses on biomarker development for end-stage organ failures, he has held the position of the Chief Informatics Officer of the Centre. 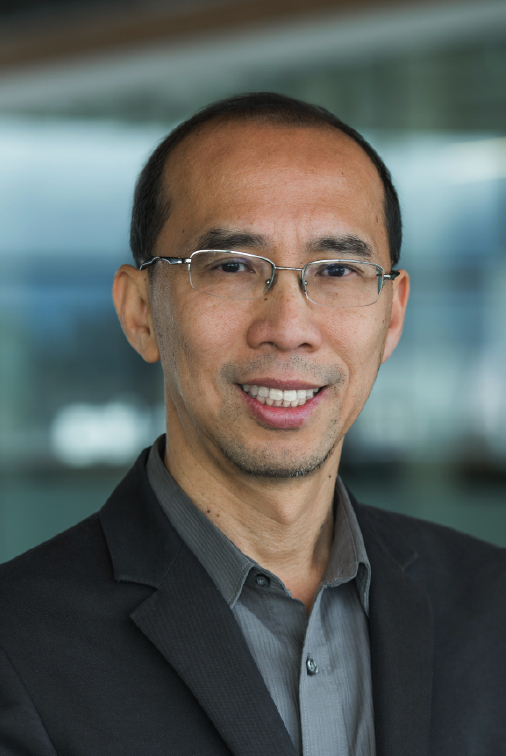 From 2009 to 2014, Dr. Ng was the associate director of the NSERC-funded strategic network on business intelligence. Alexandre’s main field of research is in statistical machine learning. He is interested in the mathematical side of the subject as well as in applications in linguistics and biology. On the methodology side, he is interested in Monte Carlo methods, graphical models, non-parametric Bayesian statistics, randomized algorithms and variational inference. His favorite applications, both in linguistics and biology, are related to phylogenetics. Some examples of recent studies include: automated reconstruction of proto-languages; cancer phylogenetics; population genetics; and pedigrees, tree and alignment inference. Jenny's is an applied statistician who focuses on data analysis and computing, especially in the R programming environment (one of the top programming languages used in data science). Her most recent work, in collaboration with colleagues in the Michael Smith Labs at UBC, produced an assay and analytical method, which allow for the detection of specific mutations in colorectal cancers – a development that will be key in guiding patient treatment (DOI: 10.1016/j.jmoldx.2015.09.003). Giuseppe has broad interdisciplinary interests. His research focuses on how natural language processing and information visualization can be effectively combined to support data analysis and decision making. More specifically, he has been working on mining and summarization of conversational data (emails, meetings, blogs); discourse parsing; the generation and summarization of evaluative text; and visual text analytic techniques for opinions and conversations. Chris is interested in the effects of occupational and environmental exposure on respiratory diseases such as asthma, chronic obstructive pulmonary disease (COPD), cancer, and pleural disease. His laboratory leverages the power of controlled human exposure methodology and high-dimensional molecular analysis to focus on the respiratory and immunological health effects of inhaled environmental and occupational threats, using diesel exhaust, western red cedar, and phthalates as model inhalants. Chris is a Canada Research Chair (Tier 2) in Occupational and Environmental Lung Disease. Artem is interested in developing new therapies to treat prostate cancer and other diseases. Specifically, his work focuses on computer-aided drug design, employing artificial intelligence in structure-activity modeling, drug reprofiling, and development of novel cheminformatics and bioinformatics tools. Gabriela works in statistical problems that usually appear in the analysis of proteomics and genomics data. In these applications, some variables may be measured with error; the number of features is much larger than the number of observations; the observations are not always independent; and outliers are present in the data. Gabriela develops statistical and computational methods to address some of these common issues in statistical genomics. In particular, she is interested in the development of robust estimation methods for sparse linear models. Gabriela is a Canada Research Chair (Tier 2) in Statistical Proteomics. Dr. Field is a stroke neurologist with research interests in clinical trials, thrombosis, and patient-centered post-stroke outcomes including cognition, pain and quality of life. She is also interested in patient care of Alzheimer's Disease (AD) patients and is exploring the use of machine learning algorithms to detect and alleviate distressed states in patients stricken with AD. Michael’s research focuses on solving large-scale optimization problems, and spans algorithm design, analysis, and software implementation. His work includes applications in signal processing and machine learning. Jennifer's research is in the field of communicable disease genomic epidemiology. She and her team uses whole-genome sequencing of bacterial and viral pathogens to understand outbreak and epidemic dynamics. Much of her work focuses on tuberculosis and she has a particular interest in using genomics and data science tools for improving tuberculosis service delivery in British Columbia. Jennifer is a Canada Research Char in Public Health Genomics and a Senior Scientist at the BC Centre for Disease Control. Kendall is a practicing emergency medicine specialist and lead Digital Emergency Medicine. His academic and research interests focuses on using digital technologies to improve healthcare delivery and raising digital health literacy. Examples of his research include using home sensors and wearables for remote patient monitoring, virtual health, social media for interprofessional communication and multicultural public engagement, and evidence informed policy translation in digital health. Laks' research interests span a wide spectrum of topics in Database Systems and related areas, including: relational and object-oriented databases, advanced data models for novel applications, OLAP and data warehousing, database mining, data integration, semi-structured data and XML, directory-enabled networks, querying the WWW, information and social networks and social media, recommender systems, and personalization. A common theme underlying his research is to model problems not traditionally viewed as standard data management problems and bring the technology of efficient data management and mining to bear on them, thus pushing the frontiers of technology. Sara develops and applies machine learning and statistical methods to study the genomics of complex diseases. In particular, she develops computational methods for combining multiple types of genomic data, such as gene expression and genotype data, and modeling prior biological pathways and networks for disentangling spurious from meaningful correlations. Sara is a Canada Research Chair (Tier 2) in Computational Biology, and a CIFAR fellow in the Child and Brain Development program. Tamara's research interests include the development, evaluation, and characterization of information visualization systems and techniques. She has worked in a broad range of application domains, including genomics, evolutionary biology, geometric topology, computational linguistics, large-scale system administration, web log analysis, and journalism. Understanding how evolution has led to the remarkable diversity of life is the key motivating force behind Sarah’s research. She combines mathematical models, experimental data analysis, and comparative phylogenetic studies to determine which evolutionary transitions are plausible, which are probable, and which are inaccessible. Yaniv studies the mathematics of information, with a focus on compressed sensing and low-rank matrix recovery. He has a recent interest in deep learning. Much of his work studies the role of randomness in the analysis of high-dimensional data. Loren’s lab employs a combination of ecological, genomic, and bioinformatics approaches to study the origin and evolution of new species, exploits the genetic diversity of wild extremophile species for crop improvement, and combats invasive weeds, focusing on members of the sunflower family. Matías' research interests are in the areas of robustness, functional data analysis, computational statistics and spatial statistics. He was the winner of the CRM-SSC Prize in Statistics (2015) for his contributions to robust statistics and for developing fast computational algorithms for robust procedures. Mark works in the area of machine learning, which focuses on automatic discovery of patterns in large datasets. His theoretical focus is on the algorithms underlying these methods. He tries to make them scale up to huge datasets and work on developing generalizations that can model very complicated patterns. He has also worked on various practical applications, including several works on medical imaging. Mark is a Canada Research Chair (Tier 2) in Large-Scale Machine Learning, a CIFAR Senior Fellow in Learning in Machines and Brains, and a Sloan Research Fellow. Sohrab's research focuses on understanding how tumours evolve over time through integrative approaches involving genomics and computational modeling. He has pioneered computational methods and software for inference of mutations in cancer genomes as well as deciphering patterns of cancer evolution which have been widely disseminated internationally. He has a track record of developing novel, innovative Bayesian statistical models, algorithms, and computational approaches to analyze large, high dimensional genomics and transcriptomic data sets, from both patient tumours and model systems--this includes advancing molecular profiling of cancer cells at single cell resolution. Leonid's research focuses on problems of visual understanding and reasoning. This includes object recognition, scene understanding, articulated motion capture, motion modeling, action recognition, motion perception, manifold learning, transfer learning, character and cloth animation and a number of other directions on the intersection of computer vision, machine learning, and computer graphics. Roger's research interests are centered around the application of computer vision and machine learning methods to the quantitative analysis of medical images. His current primary research direction is the use of medical imaging to improve the understanding of diseases such as multiple sclerosis and chronic obstructive pulmonary disease. Andy is broadly interested in the design and implementation of computer systems that support challenging data analysis tasks. In the past, his work has explored many aspects of enterprise and cloud-based infrastructure, including virtualization, storage, networking, security, and development frameworks. He is currently interested in building systems that better support audit and repeatability in order to provide "responsible" big data environments. He is also exploring the construction of large-scale datastores to support interactive analysis of genomic data. Ozgur’s work is on the theory of compressed sensing and related fields studying mathematics of information as well as the application of theory and computation in practical problems. The areas of applications he focuses on include seismic data analysis, audio signal processing, and analog-to-information conversion.